In a bit more than an hour, the lines of people waiting outside of the grand exhibition hall at Navy Pier will enter the 14th Annual Strictly Sail Chicago show. Today is day three of this 'Sailboat only' show that runs until Sunday the 1st. The lines of cars down Illinois St. and onto Lake Shore Drive are long. Licenses plates from around the country are on display: Wisconsin, Michigan, Iowa and even a few New York and Florida plates. As the country's largest indoor sailboat show, Strictly Sail is the mid-winter break for sailors accross the region and even accross the country. The crowds were large and consistent yesterday for day two. Everyone's smiles were large as people climbed aboard the latest boats from some of the world's largest manufacturer's on display. In my many conversations, I couldn't help but think. "Do these people read newspapers?" The world 'as we know it is ending'. Things are crumbling. I'm being facetious, because if you read and breathe into being the words in papers accross our country- you would believe this. You see, it's different for sailors. We are a conservative kind. Conservative in the fact that we respect the things around us. Since mother nature provides us with the winds that propel our watercraft, we fully respect the fact that at any time- things change. There is a saying about the winds in Chicago. 'Don't like the winds you see, stick around- they'll change'. So as sailors we persevere, endure. We are respectful of the elements. Mostly we are appreciative of this sport so many are passionate about. Activity has been brisk and if this continues to translate into sales. All will be well. There are many values in this economy. Smart buyers know that. Maybe that is what is driving attendance. Perhaps it may be that as sailors- we know a fresh breeze is upon us. 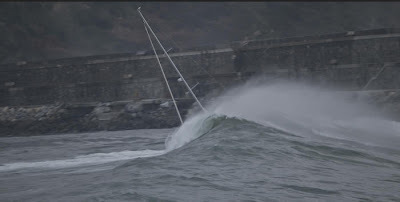 The smart sailors are preparing to be on the front end of this weather front so as the winds pickup, they'll be ready to capitalize and enjoy the wind! In these economic times, the conversation of 'value' has never become more important. When you first hear the word 'value', the first thought it conjurs up for most is 'getting a deal'. While there are many of those currently in the sailboat market, to merely focus on that aspect is very short-term thinking. Today's deal, may be tommorrow's headache. In today's economy, 'value' cuts much deeper than that. The longer-term approach to defining value is based upon a thorough process of looking at the product, the manufacturer (where they've been; where they're going) and most of all the dealer (What services do they provide? What have customers said about their experience with them?). Boat manufacturers come and go. Recently, there have been more departures than arrivals. In the months to come- the market may see more. In doing your research, You have to look at the legacy of the company, what their market capitalization is and where they are heading. Today, more than anything, these factors truly define the true value of a boat. This effects the residual value of the boat in two, three five or more years down the line should you decide to sell her. That 'hot show boat' may quickly become the white elephant boat that no one will buy at any price down the line. Many european manufacturers have tried to penetrate the US market. Many have come and many have gone. Ultimately, the lack of dealer support, dealer network and fluctuating currency does them in. Come low tide- they too will be gone. The 'term boat dealer' is loosely defined as well. Many have come and gone in this category too. Some are content with opening shop out of the back of a car or operating virtually. With no inventory to stock, their approach is to pass the savings along to you. While this might represent an immediate transfer of 'savings'. The cost is loaded on the back end. When you have a warranty claim, who will do the work? Will the company stand behind the product? Will the 'dealer'? How do you obtain parts for the boat? We are proud to say that at Karma Yacht Sales, we represent the best the industry has to offer. KYS has a legacy of providing top service for our customers and have received the recognition for it. We understand that buying the boat of your dreams is an important decision. That is how we started in this business, as customers. We also recognize that anyone can sell a boat, once. There are however, very few who do it right and can earn a customer's loyalty for a lifetime. That is what we strive to achieve. Just ask our many customers. As the largest builder of boats worldwide, Beneteau has a legacy of being in business for over 120 years. They have weathered many storms and because they have- they are poised to endure. Designed in France and manufactured with pride in Marion, S.C., they have generously invested in their own success. Cemented in the principals of quality, innovation, technology and value- it is now more than ever that selecting a Beneteau as your next boat is one of the most important decisions you can make. I've included the latest financial report for Groupe Beneteau. In reading it, you will see their outlook. A realistic one for the short-term and one that looks toward the future. A value today, tommorrow and in the years to come. French boatbuilder the Bénéteau Group says that its solid financial position will allow the group to weather the crisis and predicts recovery with double-digit growth in 2010. Bénéteau forecasts a drop in marine sales of up to 40 per cent in 2009, but intends to outperform the market. The group predicts its sales will be down 30-40 per cent for 2008-2009. Sales for 2007-2008 amounted to €1,063.8m and income €150.2m. Bénéteau's high assumption forecast for 2008-2009 is €742m in sales — a drop of 30 per cent — and profits of €29m. The low assumption forecast is €646m in sales — 39 per cent down on 2007-2008 — and €1m income. The group's 'particularly healthy' financial position of €490m net including €217m net in cash on August 31, 2008 and its high profitability will be key in maintaining investments in preparation for the recovery. Projections for double-figure growth in 2010 are based on a record new-model plan, including 21 renewals and eight range extensions, the impact of the reduction in stock on the 2009 season, and the effects of the crisis on competitors. These results and forecasts were released at a meeting yesterday with financial analysts and follows encouraging signs at the recent Paris Boat Show, where Bénéteau noticed a change in behaviour of its French customers following the caution of September, October and November. The show reported 260,000 visitors, a drop of five per cent on last year's levels. Boats represent 81 per cent of Bénéteau's sales and leisure homes 19 per cent. The group is present in over 50 countries and employs 6,000 people across 24 production sites. Commentary : We are less than 24 hours away from the start of Strictly Sail Chicago at Navy Pier (Jan 29-Feb 1) where over 300 marine manufacturers will displaying their products. This is the largest indoor Sailboat show in the country and attracts sailors from around the Midwest and beyond. Karma Yacht Sales will be displaying the Beneteau line at display #220. Stop by and visit us. I am sharing this Press release from the NMMA because to say "it has been a long winter so far" is the understatement of the season. 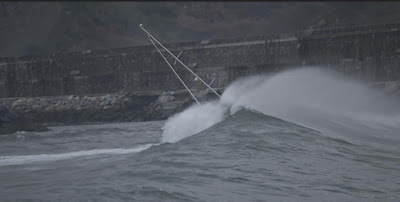 As we count the days down until we can be on the water again, we are continually bombarded by rough weather and the doom and gloom economic reports. This NMMA report shares a bit of optimism about the 2009 boat show season so far. What I've seen so far for 2009 here in Chicago parallels this report. So if you have some time this weekend, turn off CNN, put down your Wall Street Journal and come down to Navy Pier to escape albeit for a few hours. CHICAGO, January 27, 2009 – Exhibitors at the first five National Marine Manufacturers (NMMA) boat shows of the season—the New York National Boat Show, Kansas City Boat & Sportshow, Nashville Boat & Sportshow, San Diego Boat Show, and New Orleans Boat Show—are reporting better-than-expected sales and healthy buying crowds, encouraging news considering the challenging economic situation facing our industry. Early reports indicate dealers are writing contracts and selling boats at the shows, as well as walking away with solid sales leads to pursue in the months ahead. As expected, attendance was down at all five shows compared to the previous year: New York National Boat Show, 49 percent; Kansas City Boat & Sportshow, 38 percent; Nashville Boat & Sportshow, 36 percent; San Diego Boat Show, 12 percent; and New Orleans Boat Show, 5 percent. NFL playoff games involving Nashville and San Diego Teams, the Tennessee Titans and San Diego Chargers, hurt attendance in these two particular markets. New York was rocked by a winter snow storm on the final weekend of the show, helping to dramatically reduce the gate. Kansas City experienced similar weather conditions that ultimately kept people indoors during the show’s run. "We expected to be down in attendance this year as a result of the economy, and while we wished we had greater numbers through the gate, we were nonetheless happy with the quality of attendees and both encouraged and optimistic to know that serious, interested buyers were, indeed, attending and buying," says Ben Wold, NMMA executive vice president. "Exhibitors at shows in each of the five markets have been informing us that sales-wise, they’re doing better than expected—some even saying they’re outperforming last year, which tells us boat shows continue to be a solid selling venue." "We had a great New York show and sold more than 20 Glastrons," says Dave Kaczmar, a dealer representative for Glastron and Baja. "The buyers here were serious; there was very little tire-kicking going on this year." "We were very happy with the display of one of our Bentley Pontoons in the Affordability Pavilion," explains New York exhibitor Mitch Scharf of Lake Hopatcong Marine. "A lot of people came into the booth and mentioned that they saw one of our boats in the Pavilion. As a result, we collected four deposits at the show on that particular model—all of which are now beginning to close. We think the Affordability Pavilion was a great idea and hope to be part of it in the future!" Kansas City exhibitors said they were equally pleased with show results. "This was the best Kansas City show ever," says Denise Morgan of Anglers Point Marine. "Anglers Point sold several boats at the show to solid buyers." "The amount of qualified buyers at the Kansas City Boat & Sportshow was impressive," echoes Chuck Landis of Cabela’s. "We sold boats at the show and in our store because of the show advertising campaign. Even more impressive is the number of qualified leads the show produced for us." In New Orleans, exhibitors also reported better-than-expected sales and quality buying crowds. "This year’s show was one of the best shows we’ve ever had, taking in 23 deposits," says Chad Adcox of Dockside Marina. "Attendance appeared comparable to last year, with a high percentage of buyers in the mix." New Orleans exhibitors also expressed satisfaction with the amount of pre-show advertising aimed at bringing people out to the event. "If you didn’t hear about the New Orleans Boat Show, you must’ve been living under a rock," says Bruce Taylor of Xtreme Jetsport. "The ads and publicity really worked," agrees Barrett Canfield of Southwestern Yacht Sales, an exhibitor at the San Diego Boat Show. "As a company, this is the best show we’ve done in two years in terms of sales, and the best show we’ve done in three years in terms of solid sales leads," Canfield continues. "With the start of a new year, we’re really seeing peoples’ attitudes shift. They’re now saying they’re ready for ‘change,’ and as part of that change they’re saying they’re ready to buy a boat." NMMA boat shows continue through January and February. A full list of shows can be found online at BoatShows.com. The National Marine Manufacturers Association (NMMA) is the leading association representing the recreational boating industry. NMMA member companies produce more than 80 percent of the boats, engines, trailers, accessories and gear used by boaters throughout North America. The association is dedicated to industry growth through programs in public policy, market research and data, product quality assurance and marketing communications. When one thinks of problems it usually denotes the negative. That something bad is going to happen or has happened. To start 2009 out, we where faced with one such tough decision. (Actually, I should back things up a bit before we go there...) You see each year we select boats to display at the largest indoor boat show in the Midwest (Strictly Sail) that represent the broadest display of offerings for the Lake Michigan market. In a perfect world, we would love to bring every boat in the Beneteau line, but from a practical standpoint it just isn't possible- one because of sheer cost, two because some boats just won't fit through the loading door at Navy Pier. In years past, Beneteau and Karma Yacht Sales have always been one of the largest displays at this annual show. This year that will once again be true, but like many other dealers and manufacturers we have had to really look at scaling back the number of boats we will bring. While there is some support from the manufacturer, the brunt of the costs for displaying rest on the shoulders of the organizing dealer. As the larger dealer (and local dealer) our share is usually pretty sizeable in relation to the other participating dealers. For 2009, we sought to bring a diverse sampling of the product offerings from both the Beneteau Series boats and the First Series. Our original lineup included: the Beneteau 31, 34, 37, 43 and First 36.7. Logistically, our first challenge came when we found out we could not get the new Beneteau 34 shipped in time for the show. We also looked at having another participating dealer bring the boat. Scheduling conflicts nixed that possibility. So, it forced us to rework the boats we were going to bring- Round One. We reworked it to the Beneteau 31, 37,40, 43 and First 36.7- all of which we had in stock or on order to arrive for the show. The good news is the layout for the 34 is similiar to the Beneteau 37 which will be at the show. We have hulls earmarked for Chicago, we just need to put some names on those production slots and they will be ready for Spring '09 delivery. At the turn of the year, We had the forunate circumstance that Shields sailors Julian 'Skip' Schink and Rob Miller decided to join the Fastest Growing One-Design Fleet and purchase Hull #251 (our stock boat). So now we where faced with the challenge of trying to get another 36.7 in time for the show. The factory is building them and has been doing so since late last year (see photo below). The biggest challenge is that we needed one without a keel on it to be able to get it through the door at Navy Pier. She stands a bit too tall with 'keel on' to fit through the door. Due to production scheduling in the 4th quarter 2008 and 1st Q 2009, this was not posssible. 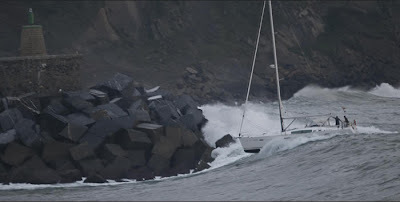 All the boats Beneteau USA has ready to ship are 'keel on'. Taking the keel off is a sizeable investment for one show. ...Enter tough decision #2. So we reworked our floor layout to account for the Beneteau 31,37, 40, and 46 no First. This was the hardest decision for us. For the past seven Strictly Sail shows the 36.7 has been the cornerstone of our display. 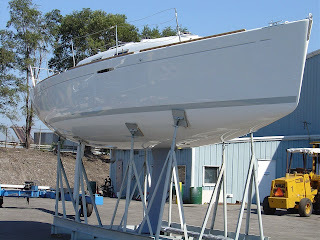 This is a boat design that has grown with us in the Lake Michigan market. With thirty boats on Lake Michigan and by far the fastest continually growing fleet in the area, it was a very hard decision to make. We were sure the 'rumors' would start from some of our eager competitors who have seen minor (if any) growth in their fleets. We can hear it now: "This is proof that the boat is no longer being made." or "They will not be able to deliver for the 2009 race season". So we figured we would publish the truth here rather you hear it from unreliable (and biased) interested parties. The First 36.7 is alive and flourishing. We are expecting to uphold the continual growth we have seen in the past seven years. Hull #251 is the first of a few we will have join the fleet in 2009. Delivery is available for 2009 models in time for the full season. So you see, some problems are good to have. Forward by Karma Yacht Sales- It's Tax Time. We often get questions about the tax benefits of owning a boat. Here are a couple that may apply. As always, you should check with your tax professional for specific details as they apply to you. For your convenience we've included links to the two IRS publications that are discussed in this article. ALEXANDRIA, Va., January 19, 2009 – Recreational boat owners who paid state sales taxes on a boat purchase, or those who secured a bank loan to finance a boat, may have some tax deductions available when filing their 2008 federal income tax return. For boat owners who paid substantial state sales taxes on a new or used boat purchase last year, the Tax Extenders Act of 2008 signed by President Bush on October 3 continues to offer a federal tax benefit with a deduction for state sales taxes. Boaters must choose either the state sales tax deduction or state income tax deduction on their federal tax return — you cannot take both. For those owners with a secured boat loan, mortgage interest paid on the loan may be deductible from your federal income taxes. Taxpayers may use the "second home" mortgage interest deduction for one primary home and one second home and must itemize deductions on their returns. A boat is considered a second home for federal tax purposes if it has a galley, a head, and sleeping berth. For more details on the mortgage deduction, go to http://www.irs.com/ and download Publication 936 or the Fact Sheets. For state tax deduction information download Publication 600, which also includes state-by-state tax tables. BoatU.S. – Boat Owners Association of The United States – is the nation’s leading advocate for recreational boaters providing its 600,000 members with government representation, programs and money saving services. For membership information visit http://www.boatus.com/ or call 800-395-2628. The Strictly Sail Boat Show happens every January here in Chicago. It is a four day event held at Navy Pier, and it features everything that is sailing, from boats to gear to sails to seminars. If you have ever attended the show, I am not telling you anything new to suggest that it is an awesome way to spend a freezing cold, snowy day in Chicago. Walking into the brightly-lit Great Hall at Navy Pier instantly transports you to summer, for a few hours anyway. One of the fascinating things about the show is the fact that it becomes something like the lake, which looms just outside, as it is filled with big and small sailboats and dinghys with masts aloft and sails hanked on. On second thought, it is even better than the lake, as there are no power boats, jet skis, or Sea Dogs anywhere in sight. I have co-ordinated the display setup for Beneteau and our company, Karma Yacht Sales, at the Strictly Sail show for the past eight years and have frequently been asked 'How do you get all this stuff in here'? I took the time a couple years ago to take pictures during much of the process and always meant to put it to music to share the week-long process with our customers, friends, and any other sailing enthusiasts. Here it is, just click on the yellow-lettered title above. Hopefully this helps to show how it all happens. The set-up for our display takes about two-hundred man-hours, lots of $$$, nerves of steel (to see $300,000 hanging 20 ft. off the ground), good insurance, and a lot of co-ordinated planning. Keep in mind, this is one display. Similar activity is going on simultaneously in the other displays all around the hall. But, if summer isn't here yet outside the hall, we'll bring it to you inside the hall. Hope you enjoy. As Lake Michigan Sailing afficionado's prepare for the Strictly Sail boat show , I had a deja vu of a common question I hear at shows. 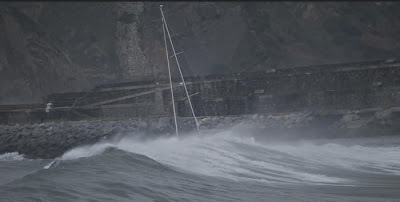 One of the questions we (as sailors) get from people new to the sport (or people unfamiliar with the physics involved in sailing) is "What keeps this boat from rolling over?" 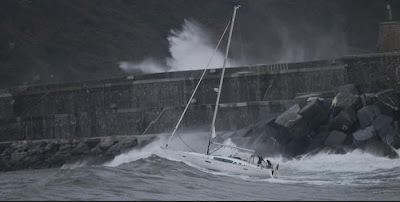 The answer (of course) is: the Keel* on the boat opposes the force of the wind on the sails therefore keeping the boat upright. 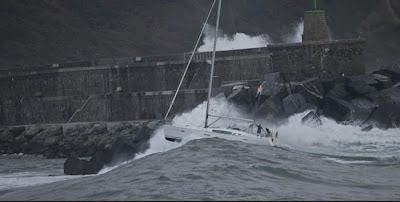 This usually begs the next question: "But what about when you don't have the sails up?" 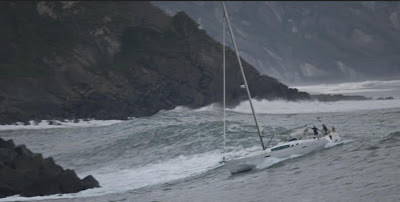 The keel is still the answer. 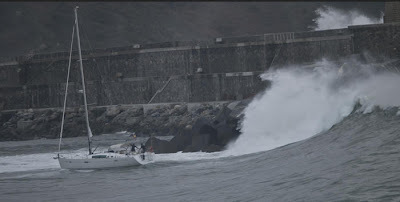 I ran accross these pictures on a feed from Naturalsurfing. 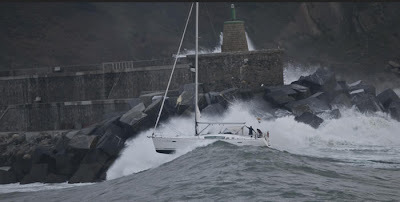 These are photos of a late model Beneteau (looks like a B40 or B43), that serve as a simple physics lesson as to how a sailboat (more importantly a Beneteau) holds up to the forces of nature. Ok, so your first question might be, "What the heck were they thinking?". But without a doubt, she holds up well with light crew and even getting smacked on the broadside by the wave! These sailors will be talking about his one for many years to come at the bar. 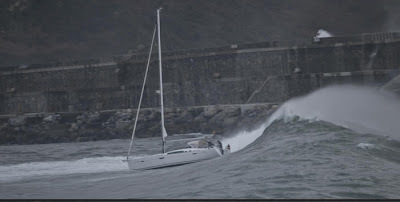 You can be sure the waves will grow to 90 feet as the years go on. Enjoy! 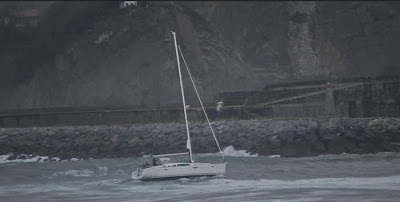 The photos were taken in the North of Spain at the mouth of the port of Zumaia. 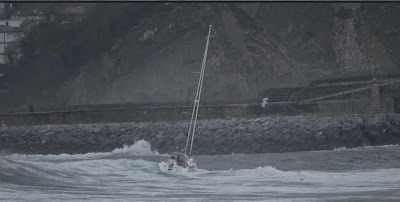 *The keel is the large metal (lead or iron) fin on the bottom of the sailboat.